This is a sibbling to regular Big Boy. 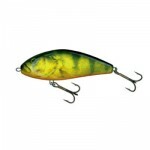 Mini Big Boy is rigged with a single trebble under the belly of the bait and has a through wire system attached to a regular jig. 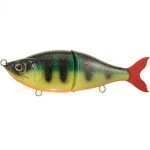 Mini Big Boy is easy to cast and has a really attractive motion in the water. Top poured it has the tail slanted to the side rather than up as a you would see on a bull dawg. 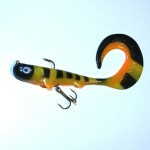 Tags: Jeff Boggs, mini big boy, softbait, and swimbait.